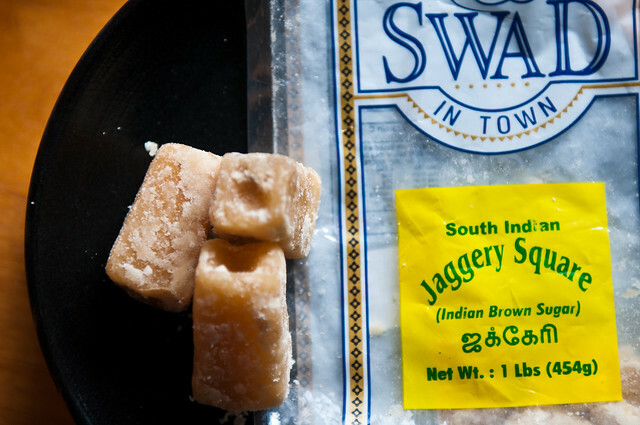 Jaggery, more flavorful than brown sugar! I searched anxiously while that big delivery of apricots ripened. 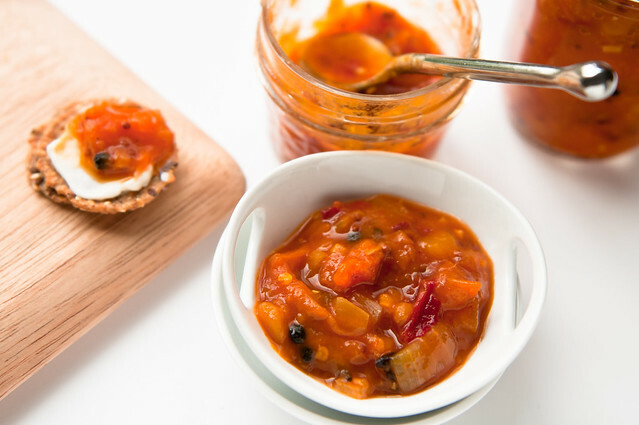 I was seriously considering coming up with my own recipe, which would let me add that coveted recipe developer to my resume, when I found this lovely family recipe for apricot chutney from Iwaruna. 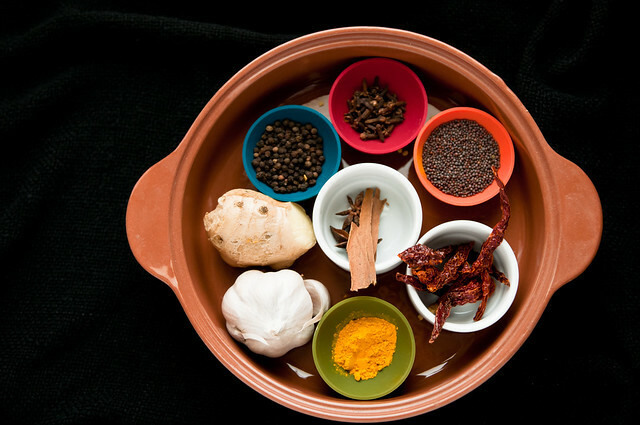 It appealed to me because I had literally every spice and aromatic used in the recipe, but what made it really attractive was that it gave me the freedom to adapt it to my tastes and include other fruits. Chop the apricots into small pieces, about 1/2 inch by 1/2 inch. Add about 1 cup vinegar and heat on medium-high, stirring frequently, until the mixture comes to a simmer. Lower the heat to medium at this point. Stir in the 3/4ths of the jaggery and continue to simmer for another 45 minutes, stirring occasionally. The next day, heat the chutney on medium high heat until it simmers, and then lower the temperature to to maintain a gentle simmer. Add any additional vinegar and/or sugar and/or red chile powder to desired taste and viscosity. Cook for an hour, allowing all the flavors to meld. While the chutney is simmering, get your water canner ready with boiling water. Make sure your jars are hot and ready for the chutney, and the lids are sitting in hot water. Fill the jars leaving about 1/4in headspace. Remove air bubbles by running a chopstick through the chutney. Clean the lip of the jars and adjust the lids and bands appropriately. Allow to cool, and then test every jar for a tight seal. Store in a cool place and serve at least 2 to 3 months after being made. Or if you're like and cannot wait, do not process one jar and store it in the refrigerator for immediate use. 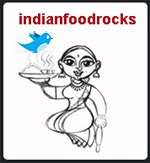 When I was satisfied with the final taste, I gave some to Medha for a taste test. She said, Whoa! That was an explosion of flavors in my mouth! And, she's right. Everyone I have shared this with has told me that they love it. Well, I'm kind of in love with it, too! We like it best on crackers but it goes very well with bagels and cream-cheese. It is great with grilled fish. The blogger at Iwaruna notes that it can be thinned out to use as a basting sauce, or as an ingredient in a marinade. She recommends removing the whole spices before eating but we like the taste of peppercorns and cloves and munch right through them. If you are blessed with an abundant crop of apricots, and you like the idea of spicy chutney more than a sweet jam or jelly, this explosion of flavors is for you! But if you aren't as lucky as I was, you could use store-bought apricots or substitute with peaches, figs, dates, and fresh currants. But don't ignore this recipe for peaches are coming soon! I used a total of 1 and 1/3 cup malt vinegar. You can substitute with apple cider vinegar, if you like. Always add about 3/4ths the total amount of vinegar and taste before adding more. 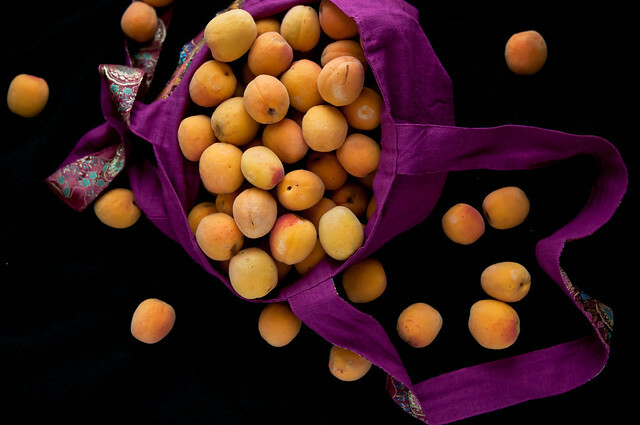 Apricots aren't consistent in their tartness or sweetness. Adjust the vinegar to your taste. The original recipe had 2 cups of vinegar for 5 lbs of fruit. The same holds for jaggery. Or brown sugar, if that is what you prefer to use. I added another 2 teaspoons of red chile powder the next day as I wanted my chutney to pack a memorable punch. Since I wanted the flavors to be predominantly Indian, I omitted allspice. When you're done canning, don't throw the water down the drain. Let it cool and then water your indoor plants as well as those in containers outdoors. its new to me...sounds yummy. That is a bright chutney with so many spices! We have mangoes and peaches and plums are beginning to show as well. I have some green mangoes that turned out to not be too tart - this recipe would lend itself well to using those. As if, I need more preserves! Niloufer's fruit chutneys are foolproof and delicious to boot! I have made many of them, and posted about it too. Never had a disappointment with her basic formulas. The recipe just looks wonderful, love the flavors! Another winning recipe, Manisha! I would never have thought of putting black peppercorns in apricot chutney but it certainly works! (As long as you don't crunch straight into one!) I made this in the crockpot so I wouldn't have to stand over it. It turned darker in colour than I expected, probably because of the long slow simmering, but that's OK. I forgot to put the onion in but it worked anyway. I used a pound of apricots and since we don't have mangoes, a few red plums. When it had chilled overnight I tasted it on my toast and it was a real wake-up call! I'm very excited about making this chutney, but here in Thailand I cant find fresh apricots but have dried apricots, can they be used and if so how would you prepare them.